This yearly page now contains only the main Rarities List! Mono 7" Singles & EPs (up to 1976) are now here, and Promotional Items (Albums and Singles) are now here. All Honourable Mentions are now here. Because of the length of this page, detailed information about the cancelled 1964 Columbia album "Bob Dylan In Concert" is now here, and detailed information about all the 1964 Vanguard releases relating to the Newport Folk Festival 1963 is now here. These 12" acetates are owned by a former music reviewer of the "Village Voice" in New York. They are in the original brown paper dust jackets, with various notes and routing info, including John Hammond's name. Also, there is a copy of the Columbia Records album sleeve plus a mastering page with a wealth of information as to contents, recording dates, release dates, etc. There is also a note on the letterhead of producer Tom Wilson addressed to the reviewer, instructing her not to mention Hero Blues in her review! More details of these acetates are required! Are they mono or stereo? They are probably mono because the 1980 and 2007 appearances of R-0390 are in mono. As far as I know all the other tracks are the released versions. This is a version with Bob on piano, one of the two complete takes (takes 1 and 3) recorded at Columbia Studios, New York, on 12 Aug 1963 (CO78980). The Witmark demo version now released on The Bootleg Series Vol. 9 - The Witmark Demos 1962-1964, 2010, has Bob on guitar, as do the out-takes from The Freewheelin' Bob Dylan, recorded at Columbia Studios, New York, on 6 Dec 1962 (CO77020). This song was replaced by One Too Many Mornings on the final album. The out-takes from The Freewheelin' Bob Dylan, recorded at Columbia Studios, New York, on 6 Dec 1962, appeared on the very limited Sony Music Europe 4CD-R set The 50th Anniversary Collection, see 2012. This version of Hero Blues also appeared (titled The Gal I Love) on a 4-track Columbia US acetate which surfaced in 1980, and which must predate this album, and again on eBay on a Columbia US acetate in Jul 2007. Take 3 from 12 Aug 1963 appeared on the equally limited Columbia/Legacy Europe 6LP set The 50th Anniversary Collection 1963, see 2013, and is in fact this version. More details of these acetates are required! Are they mono or stereo? R-0022 Blowin' In The Wind - recorded live at the Newport Folk Festival, Newport, RI, 26 Jul 1963, released in 1964 on the Vanguard LP The Newport Folk Festival - 1963: The Evening Concerts Vol. 1, see here (stereo version). If mono this would be R-0022M. 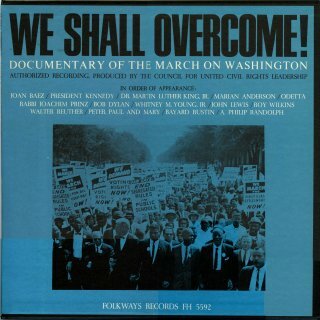 I don't know whether this is the interrupted version on We Shall Overcome or a complete version - R-0024 has now been released in complete form on the Columbia/Legacy/Sony Music Europe 6LP limited edition 50th Anniversary Collection 1963, Dec 2013. R-0219 Troubled And I Don't Know Why (with Joan Baez) - live Forest Hills Tennis Stadium, New York, 17 Aug 1963 (released in 1993 on the Joan Baez Vanguard boxed set Rare, Live & Classic, see 1993). The performance is also included on the CD Songs From Sing Out! which accompanies Vol. 45 #3 (Fall 2001) issue of "Sing Out!" magazine (see 2001). Two solo songs by Bob from this show, Only A Pawn In Their Game (R-0891) and A Hard Rain's Gonna Fall (R-0892), appeared on a Riverside Records 12" acetate LP, see 2011. 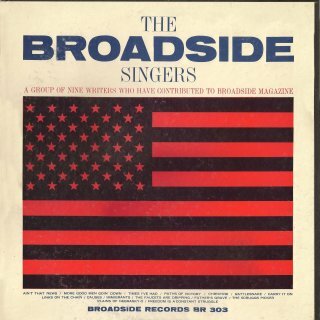 R-0458 Paths Of Victory - Bob sings backup vocals on this cover version by The Broadside Singers of the Dylan song eventually released on The Bootleg Series Vols. 1-3, 1991. The Smithsonian web-site says that Patrick Sky takes the lead vocal, but Peter Stone Brown says it's actually by David Cohen (later David Blue). 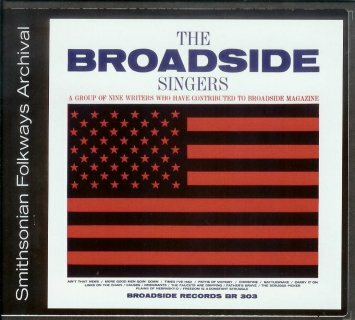 This track is now collected on the boxed set The Best Of Broadside 1962-1988, Smithsonian Folkways Records, 2000. Thanks to Jack Guerreiro for confirming this possible Dylan involvement from the Smithsonian Folkways web-site (this site listed it before they did). It's worth adding the caveat that the recording took place in New York on 29 Oct 1964 and neither Glen Dundas nor Michael Krogsgaard list a Dylan involvement in this date. Peter is also sure that Bob does not appear on this performance, but it's listed here for completion. The 1964 LP comes in a plain black sleeve with a wraparound label pasted over the front and part of the back. There was also a folded booklet. The record has pale orange Broadside labels. 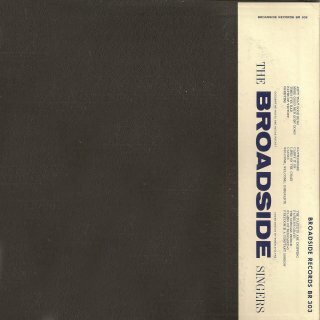 Both Broadside Ballads Vol. 3 and The Best Of Broadside 1962-1988 are available by mail order from Smithsonian Folkways Records The 1960s albums are supplied as CD-Rs and original LP artwork and liner notes are provided on a PDF file on the CD-R. The CD-R comes in a generic double card sleeve with the original front artwork and track list pasted on a label. Thanks to David Plentus, Jack Guerreiro and Manuel García Jara for information and scans. 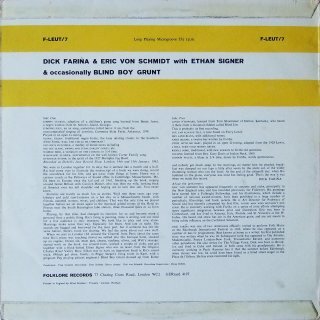 This album was recorded at Dobell's Jazz Record Shop in London on 14-15 Jan 1963, Bob (as "Blind Boy Grunt"), who was present on 15 Jan 1963 only, supplied harmonica and back-up vocals to the tracks listed below. This album, which was released in mono only, was reissued several times with label and/or sleeve variations. Jean-Pol Hiernaux reports that Douglas Cooke, webmaster of the Richard and Mimi Fariña fan site, gives this album a release date of May 1963, see . Ian Woodward also believes May 1963 to be the release date. The date I've used comes from Glen Dundas - there is no date on the record sleeve or labels. Folklore F-LEUT/7 (UK) - front scan by Gerd Rundel (test pressing) Gerd Rundel has a copy of this album in what looks like the normal fully laminated sleeve with two folded-over flaps on the rear, where the record labels are plain white with typed text in black and red, which would indicate a test pressing. The record is made of heavyweight vinyl and has the same matrix numbers as those on the regular pressings: Side 1 - DW 133-2 (stamped), Side 2 - DW-134-3 (handwritten). For comment on the different commercial label designs, see below. This track is now included in a 4CD UK compilation Midwinter from Free Reed Records, see 2006. This is not Christmas Island by Lyle Moraine, recorded by Bob in 2009 on Christmas In The Heart. The information given re R-0011 to R-0016 is the commonly accepted view of Bob's contribution and the writer credits (all the tracks previously listed have prominent harmonica). 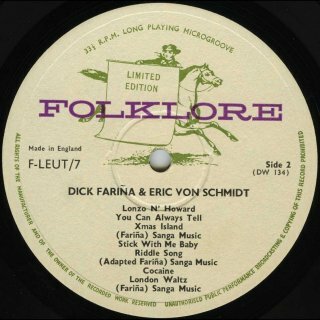 However, Gil Walker comments: "In "Positively 4th Street," David Hajdu reports that London Waltz, on the 1963-recorded Fariña/von Schmidt LP, is actually a song that Dylan, Fariña, and von Schmidt improvised together two days before it was recorded. It is, of course, impossible to determine how much (if any) of Dylan's contribution survives on the recorded song. 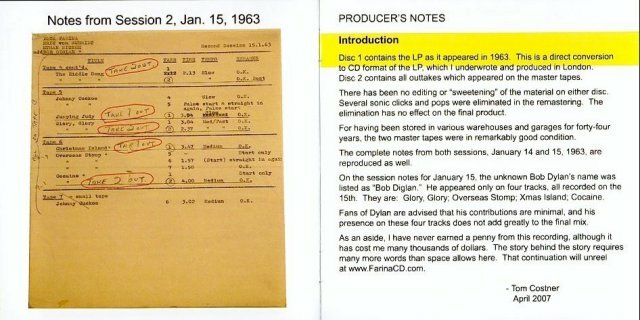 Hajdu also had access to the master tapes and session logs for the album, and declares that standard reports of Dylan's contribution to the LP are incorrect. (Notes to p.141, US edition) He says that London Waltz, Overseas Stomp and You Can Always Tell were recorded on January 14, without Dylan. He also notes that the January 15 recording of Xmas Island, with Dylan, is missing from the master tapes (implying, I guess, that a different take was released). Finally, he reports that three out-takes of Overseas Stomp with Dylan backup were recorded, and remain unreleased." 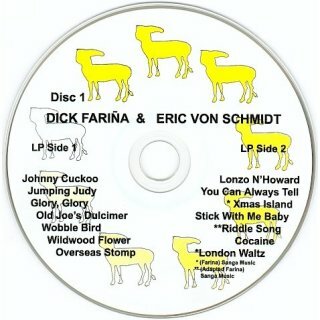 The illustrations of the session recording sheets in the 2007 CD reissue (see below) show that Bob (listed as Bob "Diglan") was indeed present on 15 Jan 1963, and played on Glory, Glory, Xmas Island, Overseas Stomp and Cocaine. I have now changed the entries for London Waltz, You Can Always Tell and the released take of Overseas Stomp to show Bob's contribution is not confirmed, although Peter Stone Brown is adamant he can hear Bob on London Waltz. The album was produced by Tom Costner, who states in his 2007 Producer’s Notes: “On the session notes for January 15, the unknown Bob Dylan is listed as “Bob Diglan”. He appeared on only four tracks, all recorded on the 15th. They are Glory, Glory, Xmas Island, Overseas Stomp and Cocaine. Fans of Bob Dylan are advised that his contributions are minimal, and his presence on these four tracks does not add greatly to the final mix." As stated above, the released take of Overseas Stomp is actually take 3 from 14 Jan 1963, when Bob wasn’t present. Despite the fact that CD2 of the 2007 Solano release is supposed to contain all out-takes from the master tapes, takes 5-7 of Overseas Stomp with Bob are still unreleased (take 5 was a false start, but takes 6 and 7 were 1:57 and 1:50 respectively). CD2 contains only takes 1, 2 and 4 from 14 Jan 1963. The album also contains several songs with quotes used in songs on Time Out Of Mind and "Love And Theft". Ian Woodward noticed that there are two basic versions of the rear sleeve. In the older version the West Brothers printers' address ends in "Mitcham". In the later version the "Mitcham" has been removed, so that the address ends in "Limited". Presumably West Brothers moved premises. 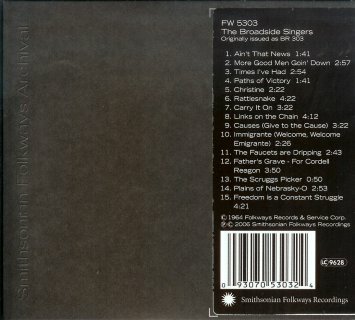 The other variations occur with the layout of the track listing further up the sleeve. The bottom of the Side Two listing ("LONDON WALTZ') lines up either with "Carter Family song" or with "Memphis Jug Band". In most copies it lines up with "Memphis Jug Band". 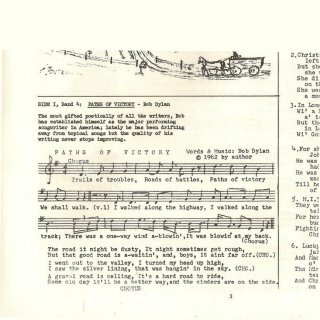 However, on some copies of the "Mitcham" version (but not the version shown above) it lines up with "Carter Family song". Precisely how many variants there are is not yet determined. My copy's label: *White label. All ink is in black. *Even the Folklore name is black. *The newspaper the rider figure is holding out contains the words "Made in England" *Song titles on each side are displayed horizontally, that is, some lines have 2 songs titles *Farina has three parenthetical attributions. No other track has a credit, not even Trad. *Serial number is F/Leut 7 *Matrix number in the trailoff on Side 1 is DW+133+3. On Side 2: DW+134+3. Both are hand-etched. eBay label: *White label. Ink for the rider and legal info around the perimeter appears to be a sepia-toned brown. 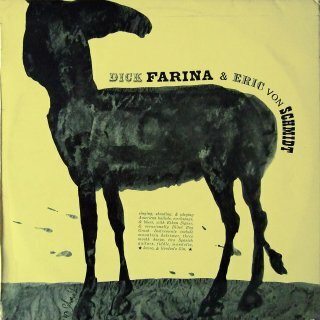 *Looks like Farina and Von Schmidt's name are in black ink and the songs are in black ink, too. 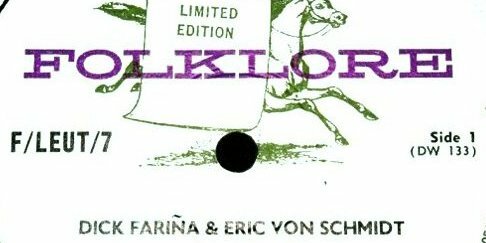 *The Folklore name is in blue *The newspaper the rider is holding out has the words "Limited Edition" *Song titles are stacked vertically with no parenthetical credits *Serial number is F/Leut 7." 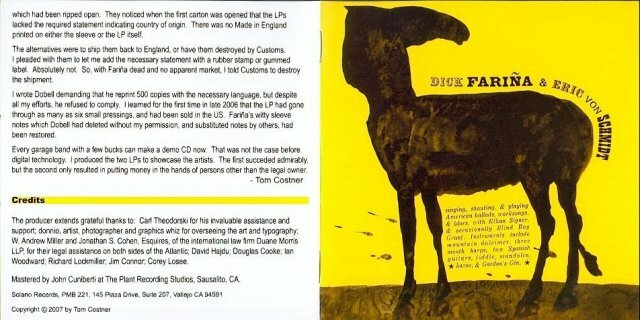 As explained in the sleeve notes by Tom Costner to the 2CD 2007 edition, the label design had to be changed to add "MADE IN ENGLAND" because the US Customs would not allow import into the USA of records that did not show the country of origin (the first 500 copies imported by Costner into the USA were destroyed by US Customs for this reason - they unreasonably would not allow Costner to add a stamp or sticker with "MADE IN ENGLAND" to the sleeve or labels). Thanks to Arie de Reus for scans of what may be the final design (Variant H) with all printing in black only. These labels also have numbered song titles printed continuously instead of one per line without numbers, as described by Don Cohen above. 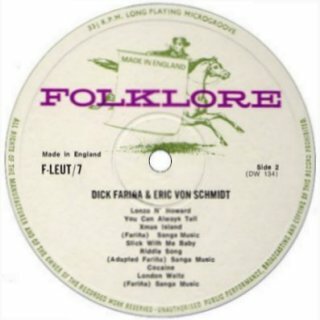 Folklore F-LEUT/7 (UK) - Side 2 scan by Kenneth Robson (variant D) Ian Woodward has provided scans of all the Side 1 variants, but I only have scans of these three Side 2 labels. 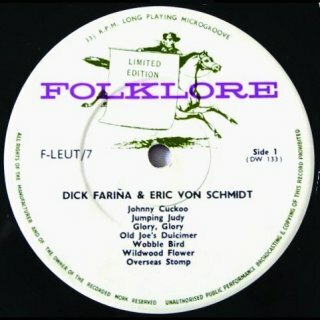 Scans of Side 2 labels for Variants A, B, C, E, and G would be much appreciated! Thanks to Hans Seegers, Kenneth Robson, Gerd Rundel, Arie de Reus, Ian Woodward and Don Cohen for information and scans. Solano 1772 (USA) - 2007 CD reissue front, scan by Jean-Pol Hiernaux Thanks to Peter Gilmer for news that this album was released in Jul 2007 as a 2CD set by Solano Records, Vallejo, CA . This release is still in mono. The Solano Records web-site lists Bob as playing only on three of the tracks, omitting You Can Always Tell, London Waltz and Overseas Stomp. The first CD in the set consists of the original album, the second CD of out-takes, none of which feature Bob. I now have the set, thanks to Jean-Pol Hiernaux for saving me the task of scanning it! Thanks to Larry Crum for further information. 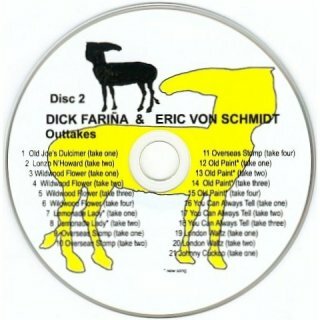 For two albums by Eric von Schmidt with liner notes by Bob, see Honourable Mentions. 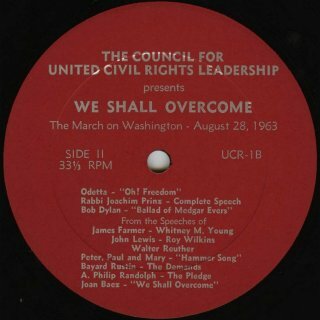 Thanks to Larry Crum for information that on this disc the Dylan song is separated into two parts, the first part contains the first verse, then part of the second with talk over, interrupted by a speech, and then the second part contains part of the third verse with talk over, and then the fourth verse. Because I don't know if the acetate above and the radio station disc below contain the full version or this interrupted version, I have used R-0024 for all occurrences. R-0024 has now been released on the Columbia/Legacy/Sony Music Europe 6LP limited edition 50th Anniversary Collection 1963, Dec 2013. Gerd Rundel's copy has handwritten matrix numbers: Side 1 - UCR-1A2, Side 2 - UCR-1B1 (the last number on each side is much smaller in size than the others). Thanks to Hans Seegers for the information that this was the first commercial appearance of this material. 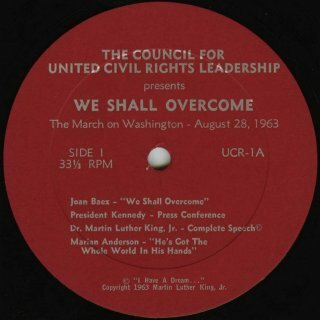 The Council of United Civil Rights Leadership was a small students label. 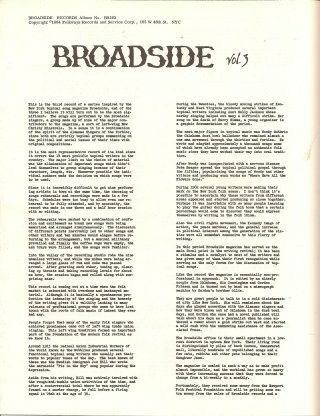 They handed the recordings over to Sis Cunningham, one of the founders of Broadside, who then produced the wider circulation album below. Thanks to Tim Dunn for information that a radio broadcast of this show can be listened to at the "Folk Music Worldwide" web-site here . The web-site compiles some shows broadcast in New York City in 1963-64. Thanks to Lars M. Banke, Kenneth Robson and Gerd Rundel for information and scans. This album was also released as Broadside Records BR 592 with the same sleeve. For information on Folkways/Broadside sleeve colour variations, see 1963. 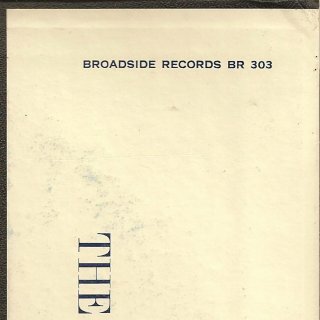 In this case the sleeve appears to be printed on a sheet of paper of various colours which was then pasted over the front and part of the back of a plain black sleeve. 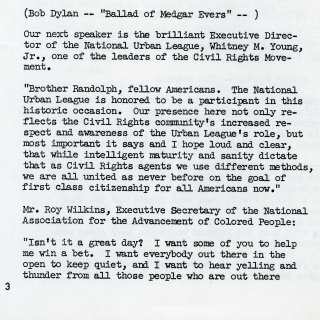 There was a four page typed booklet with a transcript of the speeches. This is the interrupted version - R-0024 has now been released in complete form on the Columbia/Legacy/Sony Music Europe 6LP limited edition 50th Anniversary Collection 1963, Dec 2013. 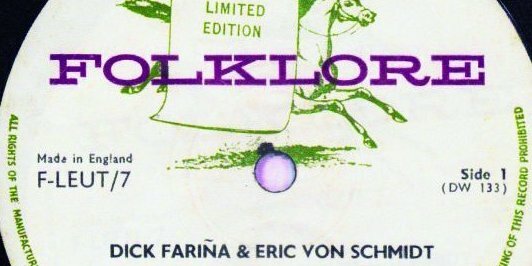 This album (along with all the other Folkways albums mentioned in these pages) is now available on CD by mail order from Smithsonian Folkways , see below. 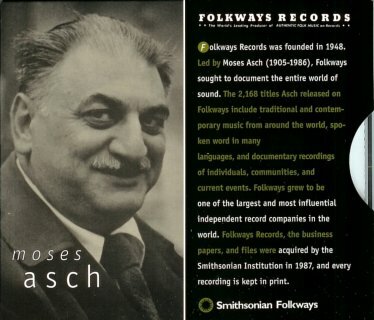 Thanks to Rob van Estrik for information that Smithsonian CDs are not mass produced, but are individually burned on to plain CD-Rs to order, and the artwork of the original Folkways LP was not included. 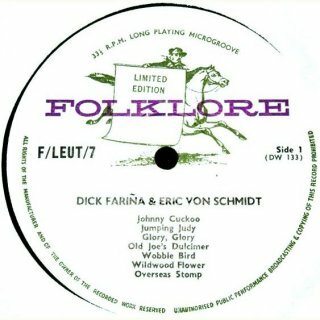 Thanks to Jean-Pol Hiernaux for new information that the original artwork can now be downloaded from the Smithsonian Folkways site in PDF form. 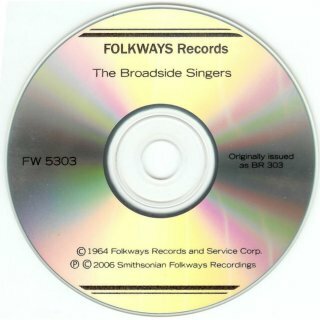 This US Folkways album was reissued in the 1990s on CD-R, see below. 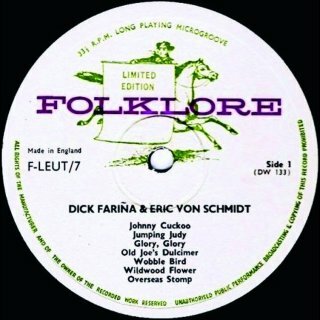 Thanks to David Plentus and Kenneth Robson for scans - Kenneth Robson's copy has the same UCR-1 labels as the release above, Folkways FD 5592 on the booklet and FH 5592 on the sleeve! 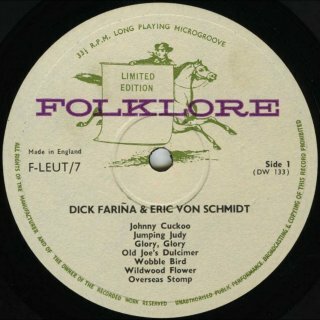 The eBay copy shown below has Folkways FD 5592 on the sleeve. 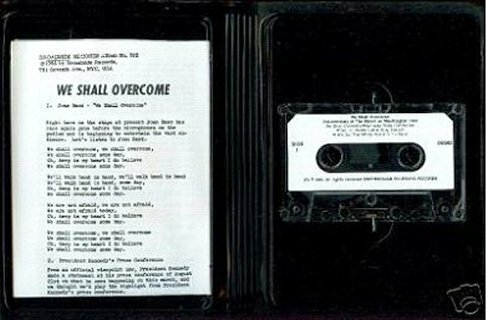 Thanks to Jean-Pol Hiernaux for finding a Smithsonian cassette version on eBay. It comes in a black plastic case with the booklet folded in four inside. Hans Seegers informs me that the live performance of Only A Pawn In Their Game is listed even more wrongly on the rear of the slipcase and on the CD rear insert as "The Ballad Of Medgar Evans"! The rear insert has only one spine strip. 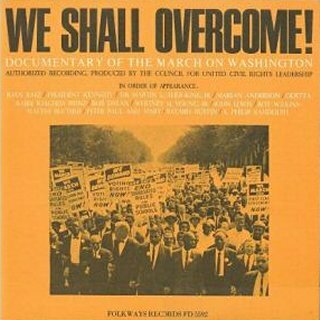 This album is a CD reissue of the 1964 Folkways LP above and is available by mail order from Smithsonian Folkways . Thanks to Hans Seegers and Jack Guerreiro for information and scans. 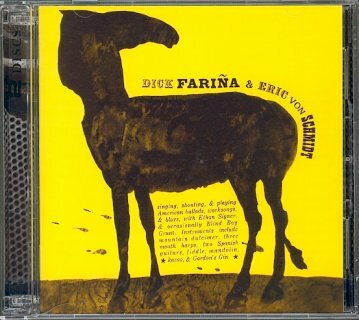 Jack Guerreiro's copy has a slightly different rear insert design (title on one line instead of two) and a completely different CD design from the one owned by Hans Seegers. Thanks to Andrew Wellman for scans of his copy bought in 2010, which comes in a generic dark grey card folder with the original artwork and track listing pasted to the outside. The inside has pockets for the CD-R and a booklet. R-0024 is still listed wrongly as "The Ballad Of Medgar Evans". As this is a radio station disc this may be the interrupted version, see above - R-0024 has now been released in complete form on the Columbia/Legacy/Sony Music Europe 6LP limited edition 50th Anniversary Collection 1963, Dec 2013. These two songs are the complete performance by Bob on this day - there is presumably an original US radio station disc from which these have been taken - details required! Songs recorded at the Newport Folk Festival, Jul 1963. Full details of these albums are now here. 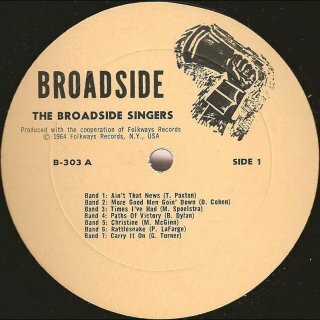 The French LP is Newport Broadside: Topical Songs At The Newport Folk Festival 1963 with a different title and sleeve, including R-0020M and R-0311M as above. 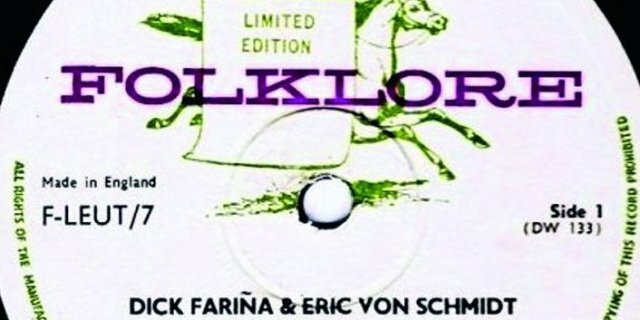 This album was released by Amadeo under license of Vanguard Records and it is part of a collection of albums called "Original Folk Song Collection". Thanks to Kenneth Robson, Gerd Rundel and Hans Seegers for information and scans. Full details of these albums are now here. Thanks to Kenneth Robson, Manuel García Jara, Hans Seegers and Stuart Moore for information and scans. Vanguard 79144-8 (USA) - front of slipcase with sticker, scan by Manuel García Jara Full details of this 1972 release is now here. Thanks to Hans Seegers, Kenneth Robson, Stuart Moore and Bill Hester for information and scans. For video footage of this performance see the 2007 US Columbia/Legacy DVD The Other Side Of The Mirror: Bob Dylan Live At The Newport Folk Festival 1963-1965, VHS & DVD 2000s Part 4. Thanks to Kenneth Robson and Hans Seegers for information and scans. Vanguard/FNAC 662085 (France) - 1992 CD release, front scan by Hans Seegers Thanks to Hans Seegers and Jean-Pol Hiernaux for information and scans. Thanks to Hans Seegers, Harold Lepidus, Bob Stacy and Peter Stone Brown for information, to Tricia Jungwirth for finding the US stereo release, to Gerd Rundel for finding the Japanese release on eBay, and to Hans Seegers for the US mono scan. Full details of this album are now here. Hed-Arzi/Vanguard AN 67-60 (Israel - mono) - front scan by Manuel García Jara This compilation was made by Hed-Arzi Ltd. in Israel for Vanguard Records. The sleeve was printed by United Artists Ltd., Israel. Although this album has the same front sleeve design as the well-known albums The Newport Folk Festival -1963. The Evening Concerts Vols. 1/2, it actually is exclusive to Israel, a unique album that includes all known Dylan performances at the Newport Folk Festival, 1963: With God On Our Side (with Joan Baez), Blowin' In The Wind and Ye Playboys And Playgirls together with This Land Is Your Land and We Shall Overcome as part of the ensemble. The album title on the front sleeve is The Newport Folk Festival - 1963. The Evening Concerts but Highlights From The Newport Folk Festival on the record labels. 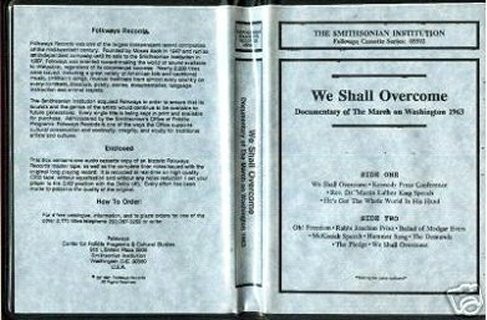 It has an exclusive tracklist taken from the albums Newport Broadside: Topical Songs At The Newport Folk Festival 1963 and from the two volumes of The Evening Concerts. The front sleeve has a different artist list matching the content. 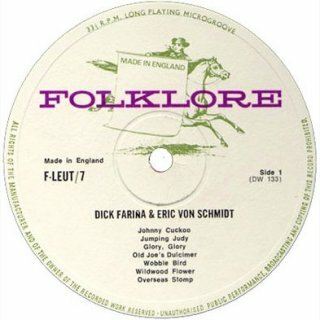 In the 1960s US Vanguard records were released in the UK on the Fontana label (part of the Philips group, later PolyGram, now Universal). The songs below were released on three EPs extracted from the Vanguard LPs above: Ye Playboys And Playgirls, With God On Our Side and Blowin' In The Wind. However, the three EPs were quickly withdrawn from sale because of legal problems with CBS Records (the then trading name of Columbia in the UK) who had licensed Bob's appearances on the LPs only. They now command high prices and I was very short-sighted to buy only TFE 18011 at the time! Full details of these EPs are now here. This song has always been thought to have been recorded at the afternoon workshop on 27 Jul 1963, but sources such as Glen Dundas and Derek Barker (in Appendix 1 to his 2008 Chrome Dreams book "The Songs He Didn't Write: Bob Dylan Under The Influence") now think it took place on the following day. Lyrics on bobdylan.com here. I also have heard of a UK 3LP set called Newport Folk Festival, Fontana TLF 6038/6041/6042 which contains these four songs - more information and scans required! This name and content appear again in the early 1990s as the name of a Vanguard CD compilation, again more details required! Thanks to Norman Barrett for information and scans. I previously listed this just as R-0039, but to achieve consistency in the list I have now allocated a separate R-number to Part 2. I assume this is mono. This seems to be a different split of the song (approx. 50-50) from the version given for R-0048/R-0595 (see 1966). Conflicting information is that this is a Vanguard single with a cover version by Joan Baez only! More information required. Columbia CS-9102 (USA) - stereo front sleeve (no mono front sleeve has yet surfaced), picture from Jeff Gold, recordmecca.com Detailed information about this cancelled album and its two proposed tracklists is now here. There was a 1962 Columbia compilation called Zenith Presents... All Star Hootenanny. That album contained three tracks by Bob - Freight Train Blues, Pretty Peggy-O and Corrina, Corrina, the regular album versions from Bob Dylan and The Freewheelin' Bob Dylan. For the mono and stereo releases of that album see International Mono Releases (Various Artists Compilations) and International Stereo Releases (Various Artists Compilations) 1960s. I was originally given a release date of Nov 1964 for this album, but as The Times They Are A-Changin' (CL 2105) was released in Feb 1964, and Another Side Of Bob Dylan (CL 2193) was released in Aug 1964, I think that for CL 2122 a date of Apr 1964 is more likely. Manuel García Jara has found a list of all Columbia US CL/CS album catalogue numbers used in 1963-64, but sadly they are not dated. For a full list of the compilations on which this mono track has appeared, also see 1962. The sleeve notes for this album were by music critic Linda Solomon, who correctly identifies Bob's Sep 1961 recording session with Carolyn Hester as his first (not as long believed the Harry Belafonte Midnight Special sessions, also see 1962). On Side 2 this album also contains Blowin' In The Wind, the album track from the mono release of The Freewheelin' Bob Dylan. The US rear sleeve has a "A" at bottom right next to the track timing box (copies from Hans Seegers and Manuel García Jara both have this). Thanks to Ian Woodward for the information that this album was included as the 5th LP in the Columbia Record Club release of an Elektra US boxed set called The Folk Box. The regular Elektra release of the box was without Dylan - it had four LPs and a 12" square of thick card to leave room for a 5th LP from the Elektra folk releases. Columbia CL 2122 (Canada mono) - front scan by Manuel García Jara The Canadian mono rear sleeve has a "4" to the right of the very bottom line of text - this is normally a US printer code denoting that the sleeve was made by Imperial Packing, Indianapolis, IN. However, the text "PRINTED IN U.S.A." is missing from the Canadian rear sleeve. The record was made in Canada and has red Columbia "two eye" labels. I was again originally given a release date of Nov 1964 for this album, but the UK CBS BPG catalogue number is positioned differently between UK Dylan releases from where the US release is positioned between US Dylan releases: The Freewheelin' Bob Dylan (BPG 62193) was released in Nov 1963, and The Times They Are A-Changin' (BPG 62251) was released in May 1964, I think that for BPG 62217 a date of Apr 1964 is also more likely. CBS BPG 62217 (UK mono) - front scan by Manuel García Jara The record of the UK release has orange CBS labels. The matrix number of "BPG-62217 1L" and the text "RECORDING FIRST PUBLISHED 1963" to the right of the centre hole indicate that the album was made for CBS by Philips ("1L" and on Side 2, "2L", indicate a Philips recording is mono). The first releases of Bob Dylan albums up to Another Side Of Bob Dylan in late 1964 were made by Philips, see International Albums (Regular). Although the labels are dated 1963, the catalogue number implies the album was not in fact released until 1964. The records of all these releases have orange CBS labels. For a New Zealand mono EP without rarities taken from this album, see Mono 7" Singles & EPs 1963-64. The New Zealand LP sleeve was printed in New Zealand by Cello-Kraft Limited and the record was manufactured there also. Thanks to Hans Seegers, Stuart Moore, Bill Hester (Carolyn's cousin) and Manuel García Jara for information and scans. I was originally given a release date of Nov 1964 for this album, but as The Times They Are A-Changin' (CS 8905) was released in Feb 1964, and Another Side Of Bob Dylan (CS 8993) was released in Aug 1964, I think that for CS 8922 a date of Apr 1964 is more likely. Manuel García Jara has found a list of all Columbia US CL/CS album catalogue numbers used in 1963-64, but sadly they are not dated. For a full list of the compilations on which this stereo track has appeared, also see 1962. This album also contains Blowin' In The Wind, the album track from the stereo release of The Freewheelin' Bob Dylan, again on Side 2. There is a 1962 American album with the title Zenith Presents... All Star Hootenanny that has three tracks from Bob but none of them are rarities - for more details see International Compilations: Various Artist Albums 1962-69. Columbia CS 8922 (Canada stereo) - front scan by Manuel García Jara The Canadian album is virtually the same as the American album, with just "PRINTED IN U.S.A." missing from the rear sleeve and "PRINTED IN CAN." added to the record labels. I was again originally given a release date of Nov 1964 for this album, but the UK CBS SBPG catalogue number is positioned differently between UK Dylan releases from where the US release is positioned between US Dylan releases: The Freewheelin' Bob Dylan (SBPG 62193) was released in Nov 1963, and The Times They Are A-Changin' (SBPG 62251) was released in May 1964, I think that for SBPG 62217 a date of Apr 1964 is also more likely. The front sleeve of the UK release has a CBS logo without a catalogue number and a silver "STEREO" logo with arrows but without "360 SOUND". The UK stereo record has orange CBS labels. The matrix number of "SBPG-62217 1Y" and the text "RECORDING FIRST PUBLISHED 1963" to the right of the centre hole indicate that the album was made for CBS by Philips ("1Y" and on Side 2, "2Y", indicate a Philips recording is stereo). The first releases of Bob Dylan albums up to Another Side Of Bob Dylan in late 1964 were also made by Philips, see International Albums (Regular). Although the labels are dated 1963, the catalogue number implies the album was not in fact released until 1964. CBS SBP-233111 (Australia stereo) - front scan by Stuart Moore The front sleeve of the Australian release also has a CBS logo without a catalogue number but the "STEREO" logo with arrows and "360 SOUND" is on the white background. The Australian record has orange CBS labels. Thanks to Sergio Magnacca and Mark Booth for information and to Hans Seegers, Wim van der Mark, Stuart Moore and Manuel García Jara for scans. On Side 1 Dave Ray performs Fixin' To Die, which Bob recorded for his first album. These are the only two mono releases I've found so far - for more information about the album, see the stereo entry. 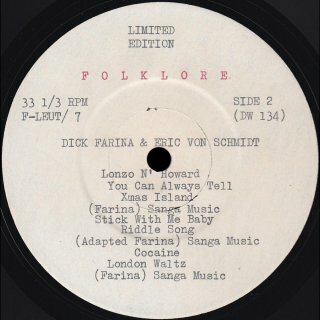 Thanks to "Hollow Horn" for information that Bob is rumoured to play harmonica on Blow Whistle Blow by Eric von Schmidt (track 2, Side 1). However, he isn't listed in the musician credits, and I have not seen any information confirming this. I have two mono copies, one from the USA and one purportedly from the UK. My "UK" release is actually the US mono release, but it has a sticker at top left on the rear sleeve from "MECOLICO", the Mechanical Copyright Licences Company Ltd. This means it was imported legally into the UK and the appropriate royalties were paid. The Elektra address on the rear sleeve is 51 West 51st Street, New York, see below. My copies have the folded insert mentioned below, printed not photocopied. The record of Colin Baker's US mono copy, also bought in the UK, appears to be in a generic inner sleeve, both my copies are in plain paper sleeves. Both my copies have handwritten matrix numbers: Side 1 - EKL-264A, Side 2 - EKL-264B. Thanks to Ian Woodward for information and to Hans Seegers and Colin Baker for further information and scans. Rob van Estrik says: "The Blues Project LP originally was issued with a separate insert with detailed liner notes by Paul Nelson. Later pressings omitted the insert. About Bob Landy the notes say: 'To musicians, his piano playing is almost legend. On Downtown Blues, we have a rare recording of him playing treble piano with Eric Von Schmidt.' 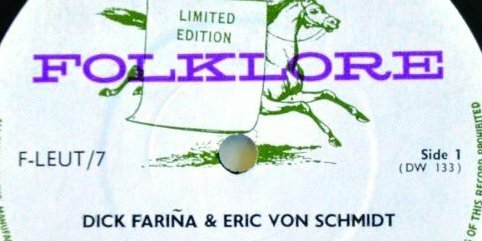 On the stereo mix (Elektra EKS-7264) you can hear Von Schmidt’s playing on one channel and Dylan’s typically hammering style of playing on the other." For the insert, included with the US and UK mono and stereo copies, see above. The stereo US record was re-released twice in the 1970s, when Elektra Records had different New York addresses in each case. The address on the 1960s album is 51 West 51st Street, on the early 1970s re-release 15 Columbus Circle, and on the late 1970s release it is 1855 Broadway. The insert that came with the 1960s releases also showed the 51 West 51st Street address. 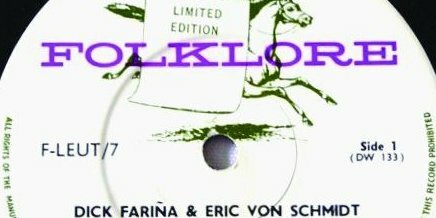 The 1960s release shown has plain buff Elektra labels with a white "E" logo, and the stereo LP has "STEREO" printed twice. The 1970s release labels have a butterfly design. Thanks to Hans Seegers for pointing out that the Alan Tautfest's stereo copy must be a reissue from 1966 or later, because in 1964 Elektra in the USA used the same label style as shown on the mono US label above, with a logo of a guitar player. The "white E" logo labels were not introduced until 1966, and were replaced in the 1970s by the butterfly logo labels. 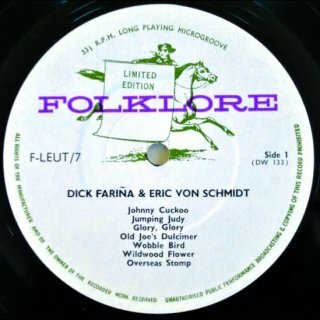 Scans of an original 1964 release with guitar player labels needed! Kenneth Robson's late 1970s US copy comes with photocopied inserts as shown (my 1964 US mono copies have a printed insert). 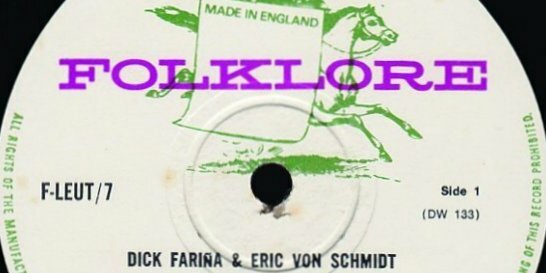 Ian Woodward's 1970s US stereo copy with the butterfly record labels was imported into the UK and has a sticker on the shrinkwrap with the pink MECOLICO logo as above and the following wording: "SPECIALLY IMPORTED BY VIXEN 25p" over two lines and then in small typeface, "Under licence from M.C.P.S. on payment of the prescribed royalty payment to the British Copyright owners". This copy did not have an insert. Picture from www.amazon.co.uk (non Dylan) This Blues Project album was also released on vinyl in the UK in 1987 by Edsel, but was not reissued on CD until it was included in the 2015 Elektra Europe set of five original 1960s albums, The Greenwich Village Folk Scene: Original Album Series, see below and 2015. The 1964 Blues Project album is a compilation of tracks by New York Greenwich Village artists Dave Ray, Eric von Schmidt (see above), "Spider" John Koerner, Geoff Muldaur, Dave van Ronk, Ian Buchanan, Danny Kalb and Mark Spoelstra. It was produced by Paul A Rothchild (who later produced The Doors) and Elektra founder Jac Holzman. The group called The Blues Project who recorded for Verve/Folkways was formed in 1965 and included Danny Kalb from this 1964 project plus regular Dylan sidesman Al Kooper (see Honourable Mentions and Red Herrings). Bob does not play on any of their albums. Thanks to Hans Seegers, Olav Langum, Alan Tautfest, Peter Gilmer and Colin Baker for information and scans. This 5CD set called The Greenwich Village Folk Scene: Original Album Series in a slipcase contains five original Elektra albums from the 1960s, including The Blues Project. The individual CDs are in card sleeves reproducing the original stereo album artwork. For more information, see 2015. R-0038 is also included in the 5CD Rhino compilation Forever Changing: The Golden Age Of Elektra Records 1963-1973, see 2006. For Journey To Love: Rare & Early Elektra Classics, a compilation CD given away with the UK music magazine "Mojo" in Nov 2010 also containing R-0038, see 2010. Thanks to John Buck for information and scans. The album also includes Ramblin' Jack Elliott singing traditional songs Roving Gambler, a live recording of which from El Rey Theater, Los Angeles, 17 Dec 1997, was released by Bob on European Columbia Love Sick singles, and also on a bonus disc included with the Australian tour limited edition of Time Out Of Mind, for both see 1998; House Of The Risin' Sun, recorded by Bob on Bob Dylan (1961) and Diamond Joe, recorded by Bob on Good As I Been To You (1992). This is the only occurrence of the mono version, for the stereo version see below. The US album was released twice, first with dark purple labels and then with buff labels. The sleeves were identical. 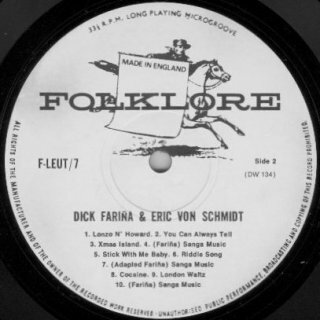 The UK mono release on the Fontana label (the Philips imprint that released Vanguard recordings in the UK at the time, see above) is extremely rare. There are also reports of this song appearing as a Vanguard single - catalogue number? 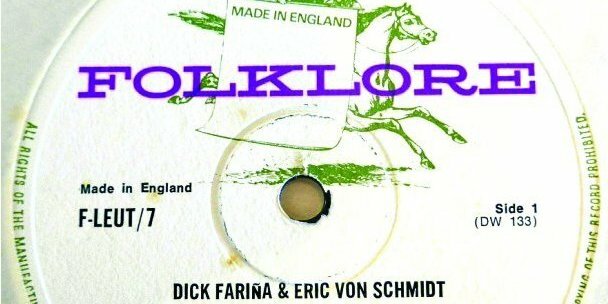 The only CD release of this album in its original 12 track 1964 form was on behalf of Vanguard by the King Record Co in Japan in 1998 in the "Vanguard Folkie Sound Collection" series. The release date was 22 May 1998, the withdrawal date was 21 May 2000 and the obi price was ¥2,200 (¥2,095 plus sales tax). The Vanguard albums The Essential Ramblin' Jack Elliot, Jack Elliott Plus Live and Best Of The Vanguard Years in fact contain all 12 tracks of the album! R-0019 is now readily available on CD on the Vanguard Jack Elliott compilation albums The Essential Ramblin' Jack Elliot (2LP set - 1976, released on CD in 1998); Jack Elliott Plus Live, a Japanese CD release with this album plus ten live tracks from The Essential Ramblin' Jack Elliot (Vanguard/King Record Co KICP-2027, see 1990); Best Of The Vanguard Years (2000) and Vanguard Visionaries: Ramblin' Jack Elliott (2007), and also on the various artists compilation Vanguard Sessions: Folk Hits (1998). These and all other Vanguard records mentioned in these pages can easily be ordered on-line directly from Vanguard Records . Thanks to Wim van der Mark, Jean-Pol Hiernaux and Wil Gielen for information, and to Hans Seegers and Jack Guerreiro for scans. This boxed set was produced on behalf of the US company General Electric. The record sides are numbered XSV 86464 to XSV 86471, the records themselves don't have CSP catalogue numbers. For a complete list of all the compilations this track has appeared on, also see 1962. I'll Fly Away is on Side 1 of Record 2 of "Folk Ballads" (Record 4 of the set), along with Talkin' New York from Bob's first album, mistitled as "Talkin' N.Y.". Record 4 turned up again with the exactly the same track list and mistitled Dylan track as Vol. 3 of a Canadian Columbia Special Products 10LP set, Fleetwood Presents Stereo Highlights From The World Of Music, see 1965! Thanks to Stephen Braitman for initial information, and to Hans Seegers for further information and scans. The existence of this item is disputed by Hans Seegers, can anyone confirm it? It was certainly never released commercially. Manuel García Jara thinks that this is a mistake, and actually refers to the Johnny Cash cover of It Ain't Me, Babe, originally released by Columbia in USA in Sep 1964 with Time And Time Again as the B-side. There was a promotional release with red vinyl and red text and a commercial release with regular orange labels - these two singles had generic Columbia sleeves. 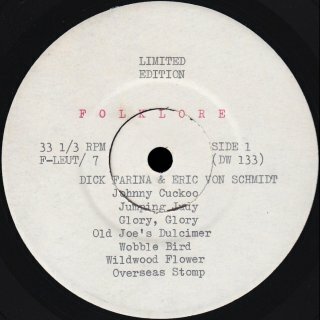 However, in Dec 1964 a new version, Columbia 4-43145, on red vinyl with back text was released with Cash’s Dylan cover on both sides; this new single usually has a generic sleeve but only a limited quantity of copies have the white Columbia sleeve shown with promo text explaining the reason why this single was released again. Kings And The Queen Vol. 2, which contains two further Dylan rarities with Victoria Spivey and Big Joe Williams, R-0086 and R-0087, was not released until Jul 1972, see 1972. These albums are mono only. 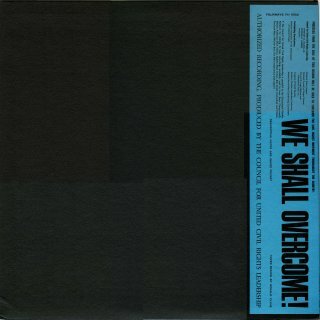 They are both still available on vinyl from www.spiveyrecords.com. The photograph on the rear sleeve of New Morning is young Bob with Victoria Spivey, taken by Victoria's husband Len Kunstadt at Cue Recording Studio, New York, 2 Mar 1962, when these performances were recorded. Bob recorded this song on his Good As I Been To You album, 1992. On the rear sleeve it states "BOB DYLAN, the young folk singer poet of Columbia Records, is the harmonica accompaniment on A-3, B-2. His voice is also heard on A-3." Thanks to Hans Seegers for the 1964 scans and the information that the original sleeve scan shown here (now listed below) was that of the 1972 reissue and not of the original album! Spivey LP 1004 (USA) - front scan by Keith `Venturoni (1960s re-release 1) The 1960s re-releases now have black and white sleeves instead of orange and brown. The first 1960s re-release comes in the same sleeve as the 1964 release but black and white, and the record labels look the same as those of the 1964 release. The second 1960s re-release comes in the same sleeve as the first, but the record has completely different labels. "SPIVEY" is smaller, the album title is on one line instead of three, and "HIGH BLUES FIDELITY" at the bottom of the labels is missing. The third 1960s re-release comes in the same sleeve and with the same record labels as the second 1960s re-release, but the front sleeve now has a sticker with text "HISTORIC TRACKS - BOB DYLAN appears with BIG JOE WILLIAMS". Spivey LP 1004 (USA) - front photocopy by Paul Shenton (1970s re-release 1) The records with these two releases both have the same design of record labels, but the sleeves are very different from each other. On both the white front panel with "HISTORIC TRACKS - BOB DYLAN appears with BIG JOE WILLIAMS" is printed, not a sticker. Paul Shenton's copy comes in a sleeve that is made of up of a reused sleeve with the new design pasted over it. You can see the original artwork through it, especially on the front, although it doesn't show in the pictures. The noticeable thing about the rear sleeve is that the horizontal spaces between the two sets of left and right photos have disappeared, and the photos look as if they have been clipped on along the left-hand edge. There are now three lines of text at bottom right on the rear of both of these sleeves instead of the single line on earlier and later releases. Arie de Reus' copy has a unique yellow border on the front and back of the sleeve. The rear sleeve has a new design - the right-hand panel is the same as on previous releases, but the four artist photos are now missing on the left. The record labels now have "SPIVEY" at the top in large letters between two horizontal lines and the album title on one line like the immediately previous release, but the bottom text "HIGH BLUES FIDELITY" is still missing. 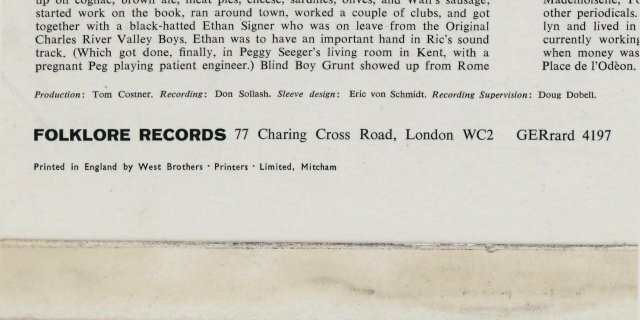 The 1972 re-release again has a printed panel in the top left hand corner with "HISTORIC TRACKS - BOB DYLAN appears with BIG JOE WILLIAMS" and the sleeve is again black/white as opposed to the original release of brown/yellow. The rear sleeve has the original 1964 design. The record labels again have "SPIVEY" at the top between two horizontal lines and the bottom text "HIGH BLUES FIDELITY" has been restored, again with two horizontal lines above and below. Doxy Records DOY 679LP (USA) - front picture from www.discogs.com Thanks to Stuart Moore for information that the album was re-released on vinyl with the orange/brown sleeve (with the "HISTORIC TRACKS" Dylan information printed) by Doxy Records in May 2013 - more information required. The rear sleeve has a completely new design. The second album from 1972 was also re-released. Thanks to Jean-Pol Hiernaux, Peter Gilmer and Jack Guerreiro for news that Spivey Records has remastered its archives and is reissuing this album amongst others by Victoria Spivey on CD for the first time, for more details, see here . This page originally claimed incorrectly the Spivey session in Mar 1962 was Bob Dylan's first commercial recording - his first was actually the Carolyn Hester sessions in Sep 1961 (see 1962), followed by the Harry Belafonte sessions in Feb 1962 (see 1962). A CD release was expected in 2008 but so far has not appeared. Thanks to Hank Wellman for pointing out that the four Victoria Spivey tracks are the only performances listed in "Bob On The Side" that are not available on CD! Thanks to Arie de Reus, Kenneth Robson, Jean-Pol Hiernaux, B. Martin and Paul Shenton for information and pictures. This US album is very similar in content to the Canadian Let's Sing Out album below. It has "CSP-128" on the sleeve and "XTV 88744" on the record labels. For a complete list of all the compilations this track has appeared on, also see 1962. This album also contains Freight Train Blues from Bob's first album on Side 2. He is billed as "Bob Dylan" on the front and rear sleeve but "Bobby Dylan" on the record label (see detailed scans below)! Manuel García Jara has a very rare copy of this album, which is a promotional album, even though there is not any promo text. It is essentially the same as the commercial album, but the top opening corner of the sleeve has been cut off (right on the front sleeve, left on the rear sleeve). The labels make this album very special, there is a white sticker glued on the centre of each label, hiding the red commercial labels. This sticker has the same information and the same typeface as the commercial labels, although on both labels the text above the centre hole has been printed higher. Thanks to Hans Seegers, Kenneth Robson and Manuel García Jara for information and scans. "Let's Sing Out" was a popular folk music programme on Canadian TV in the early 60s, this LP was a special offer from the sponsor Oxydol Detergents. Other artists featured are Pete Seeger, the New Christy Minstrels, The Travellers, Leon Bibb, Flatt & Scruggs, Halifax Three, and the Clancy Brothers and Tommy Makem. The tracks are regular album versions, not live from the TV programme. The record sides are individually numbered XTV 88804 and XTV 88805. Side 1 of Manuel García Jara's copy has a black rubber stamp with "0.99$". For a complete list of all the compilations this track has appeared on, also see 1962. This album again also contained Freight Train Blues, the regular version from Bob Dylan. Thanks to Hans Seegers, Christine Consolvo and Manuel García Jara for information and scans. This double album in a gatefold sleeve was manufactured by Columbia Special Products on behalf of General Electric. It also contained Freight Train Blues and House Of The Rising Sun, the regular Bob Dylan versions, a cover of Blowin' In The Wind by the Village Stompers, and several other traditional songs since performed by Bob. The Italian single has a different picture sleeve, and the song is called just Midnight Special. The rear has sleeve notes in Italian: the tracks are translated as "Riunione dei Zombies" and "Spettacolo di mezzanotte". Although Dylan is not mentioned, the sleeve notes say " The sound of a bluesy harmonica introduces the voice of a man singing 'Let the midnight special shine a light on me...'". As far as I know these are the only mono appearances of this track outside the original mono LP, a possible 1962 7" mono single, and a 1963 Spanish mono EP. There were also West German and Italian mono album releases. Mono 7" Singles & EPs 1962-64 These are now here: Mono 7" Singles & EPs 1962-64. Mono LPs have their own pages, see International Mono Releases. Living In Another Country: International Stereo Releases Stereo promo items for 1964 which don't contain rare material but which are still very collectable are now included with promo releases of regular albums and commercially released singles on the appropriate page in International Stereo Releases.